Registration opened up at 9 AM PST this morning and it will remain open until 5 PM PST on March 10th, so you've got a couple of days to get your name into the pot if this isn't a good time. The application process only takes about 4-5 minutes, including a few basic questions about yourself and the type of content you're hoping to see at I/O. After registration closes, Google will randomly select applicants to invite to the show. Those that receive an invite will have 24 hours to purchase a ticket or the spot will be offered to somebody else. Since Moscone West is not the venue for this year's Google I/O, it looks like the number of available tickets will be increasing. We aren't sure how many people will be invited to attend this year, but it should give quite a few more people a chance to benefit from the great content. 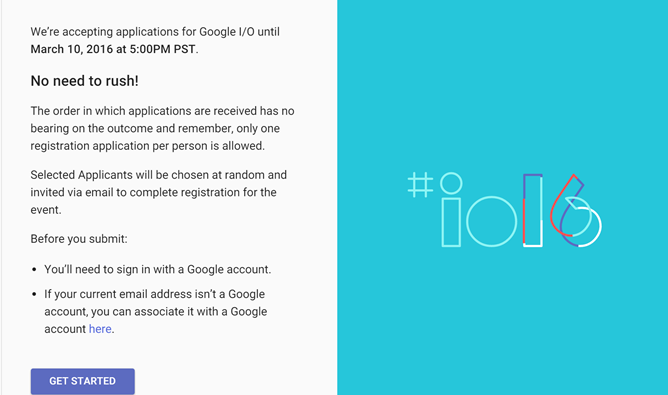 Even if you can't make it, don't forget that there are Google I/O Extended events and a great deal of the content will be live streamed or posted on YouTube within a few days of the event. Good luck to everybody applying this year!